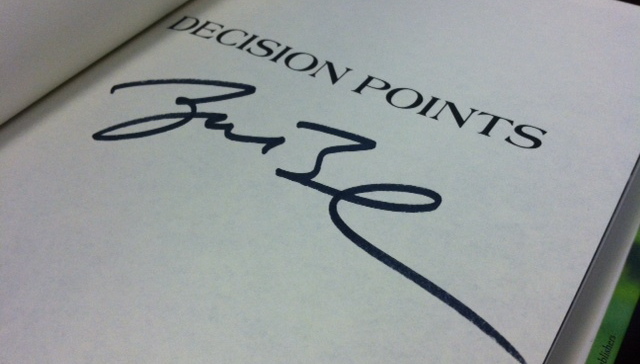 This First Edition copy of Decision Points has been personally Autographed by President George W. Bush. And Exclusively Made Available at PremiereCollectibles.com. Very limited number of these signed, first edition hardcovers. In this candid and gripping account, President George W. Bush describes the critical decisions that shaped his presidency and personal life. George W. Bush served as president of the United States during eight of the most consequential years in American history. The decisions that reached his desk impacted people around the world and defined the times in which we live. Decision Points brings readers inside the Texas governor’s mansion on the night of the 2000 election, aboard Air Force One during the harrowing hours after the attacks of September 11, 2001, into the Situation Room moments before the start of the war in Iraq, and behind the scenes at the White House for many other historic presidential decisions. A groundbreaking new brand of presidential memoir, Decision Points will captivate supporters, surprise critics, and change perspectives on eight remarkable years in American history—and on the man at the center of events.